Who doesn’t love enchiladas? This recipe is a real treat, and has been adapted from The Love & Lemons Cookbook by Jeanine Donofrio. If you aren’t familiar with Jeanine’s food, you’re missing out — the new book is a collection of some of her loveliest and tastiest recipes, which make healthy, whole, and bright seasonal ingredients the star. Here, that’s roasted butternut squash, black beans, and smoky chipotle peppers. Dig in! Preheat your oven to 400 °F. On a baking sheet, toss the butternut squash in 1 tbsp oil and season with salt and pepper. Roast until tender and slightly browned, about 23 to 25 minutes. Once the butternut is done remove it from the heat, but keep the oven on. In a blender, combine the diced tomatoes, garlic, chipotle pepper, and 2 tsp of water. Puree on high until smooth. Season with salt and pepper. Rinse and halve lime. Juice half of the lime into a bowl, and mix with the vegan sour cream. Cut the remaining half lime into wedges and set aside. Rinse, dry, and thinly slice the scallion. Place in a medium bowl. Drain and rinse the black beans and add to the bowl. Lastly, add the roasted butternut squash to the bowl and mix to combine. Season with salt and pepper. Spread ¼ cup of the salsa roja on the bottom of an 8x8 baking dish. Assemble the corn tortillas on a large cutting board, by laying them out and topping them with about a ½ a cup of filling and 1 tbsp of salsa roja. Roll each tortilla up and place seam side down in the baking dish. Top the enchiladas with remaining salsa and cover the baking dish with foil. Bake for 15 minutes. Rinse and dry the jalapeno and thinly slice. 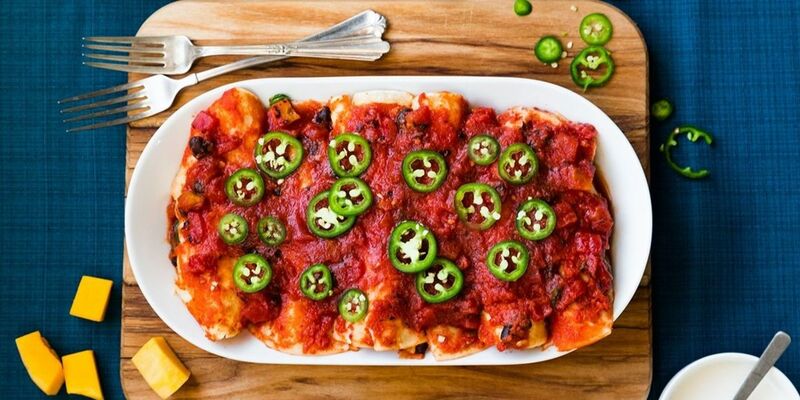 Top the enchiladas with sliced jalapeno, using more or less depending on your affinity for heat. Divide the enchiladas between your plates, and serve with the lime crema and lime wedges. Ole!